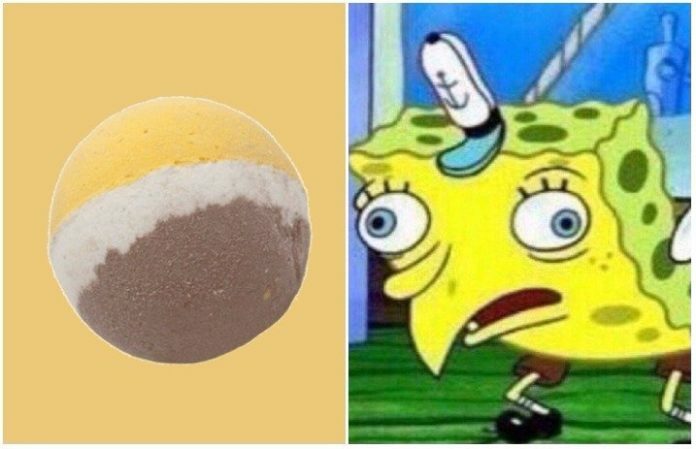 2017 logic: Memes and bath bombs are everywhere, so why not combine them? Thanks to these new meme-inspired bath bombs, you can almost literally take a bath on the internet. From fidget spinners to the “mocking SpongeBob,” your favorite jokes will now follow you into the bathroom. The meme-themed bath bombs are the newest addition of Dank Tank, a company that makes meme-themed products. There are five options of memes to bathe in, and they smell amazing. Send Nudes has a cherry blossom scent, Fidget Spinner is summer berry, SpongeBob-inspired Spongegar has a mahogany coconut fragrance, the green and black Evil Kermit is grapefruit berry and even Trash Dove will make you smell of blueberry citrus all day. While there isn't a date for new releases, there are plans for other bath bombs, according to Dank Tank. All the bath bombs are made with 100 percent natural ingredients, including coconut oil, arrowroot powder and essence salts. They are also chemical-free, certified organic and vegan, which is always good news, right? The four options are on pre-sale for $9 each and will ship on Sept. 20 from the Dank Tank website.